The 1936 Berlin Summer Olympics were to be a means of furthering Hitler's ethnic and Nationalist messages, a tool of Nazi propaganda. 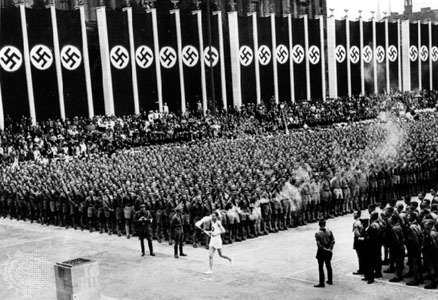 Few aspects of the bizarre and highly political '36 games exemplified Hitler's propaganda mission better than the Olympic torch relay and ceremony. The Golfpreis der Nationen organized just after the Berlin Summer Olympics was part of Joseph Goebbels global propaganda strategy. He stated back in 1933: "German sport has only one task: to strengthen the character of the German people, imbuing it with the fighting spirit and steadfast camaraderie necessary in the struggle for its existence." Though Goebbels and Hitler both seemed to have loved the idea of the torch relay, it wasn't their idea. A man named Carl Diem, the secretary general of the organizing committee of the Berlin games, proposed it, inspired by the torch that had burned over the 1928 games in Amsterdam. 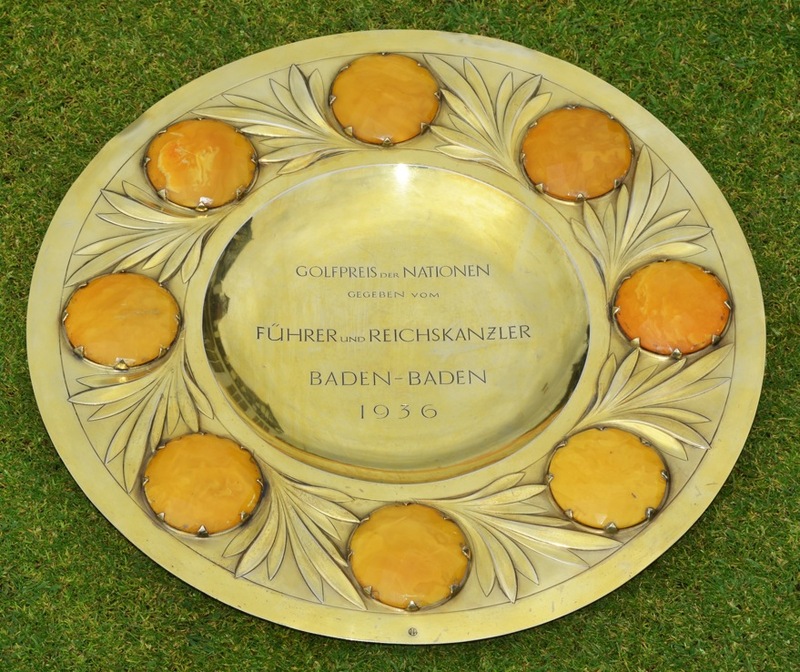 As for the Golfpreis der Nationen trophy donated by Adolf Hitler, it was an impressive silver-gilt salver, inlaid with eight large amber discs, created in the workshop of goldsmith Professor Emil Lettre, who had been appointed to the Berlin Court by Kaiser Willhelm. Amber was selected by the jeweler as it was recognized as a true German stone, found primarily along the southern shores of the Baltics. The second prize was a beautiful Meibner vase being donated by the Reich Sports Minister, Hans von Tschammer und Olsen, and the third prize, donated by the Federal Governor of Baden, took the form of a silver box from the workshop of artist Karl Lang-Hanau. The winners received not only the team prize but also a number of individual items. The first prize was not to leave Germany as it was inconceivable for Hitler and his entourage that they would loose The Golf Prize of the Nations! History would prove them wrong....first symbolic defeat of the Nazis by England (1st) and France (2nd) who were to declare war three years later after the invasion of Poland as allies! Upon Arnold Bentley's death, his son Robert generously presented all his father's trophies to Hesketh Golf Club. The commemorative salver, and individual medal from Baden-Baden are now on permanent display in the Club's 'Bentley Room', which you will have the opportunity to discover during the Normandy American Heroes History and Golf Tour! Curiously a small potter fir tree was also presented and this was planted on a sand hill behind the flagstaff, at the front of the clubhouse. It became known as the 'Hitler Tree' and, during the war years, members are reported to have relieved themselves against it, as they departed from the Club in the late evening. The tree thus benefited from regular applications of nitrogen enriched surplus water! Reason why it probably grew considerably until a fatal transfer killed it! The 'Hitler Trophy' after changing hands in 70 years or so was auctioned the 29th of May 2012, the same day that the Olympic Torch was passing through the historic city walls prior to the London Summer Olympic Games...! Coincidence? Sources: Derek Holden "Golf and the 1936 Berlin Olympics" and Max Fisher "The Nazis Origins of the Olympic Flame Relay"